Ariat Team Softshell Jacket is made from a handy, versatile material. Weather resistant and lightweight, it can be used in the Spring, Fall and even layered on Winter days to keep you warm and dry. It does all of this without being too bulky so you go around your barn chores and work out the horses without getting too hot and sweaty. If you’ve read my other Ariat reviews, such as my comparison of Women’s Paddock Boots, then you’ll know how big of a fan I am of the company. They are professional, sleek and well respected without pricing their products through the roof. The team jacket is made specifically with equestrian athletes in mind. As I mentioned, this jacket is water and wind proof thus offering protection from all the elements. It features advanced insulation in conjunction with breathable qualities making sure that you are kept warm yet relaxed. I don’t know about you, but if it’s a chilly day and I’m wearing layers, I’ll be fine while I’m grooming and tacking up. But then the second I starting working with my horse, I start getting sweaty, especially if the horse needs to be stretched out well and is a little stiff to get started. 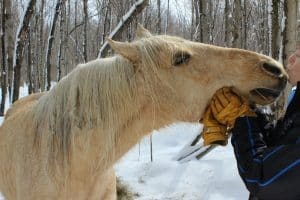 Older horses, as you know tend to need to be warmed up very well in the winter so if your horse is a little slower and heavier, it can take lots of leg to get them moving. After my ride, I used to let all that sweat just sit there. By the time I was untacking and grooming the horse, I felt like an icicle. If there was anything else to do around the barn, I would dread it and end up with colds quite often. Eventually I started learning how to layer properly – kind of like a hiker. The Ariat Team Softshell Jacket is a great top layer to make sure you’re good if there is any wind or moisture. Now when you’re riding and start to sweat, you can take off layer by layer and throw them on a stool, hand them to someone in the arena or just tie them around your waist. When it’s time to untack and groom your horse, you can just throw all the layers back on! This jacket provides awesome protection from the elements and the wonderful soft stretch material offers brilliant comfort as well as freedom of movement. The brushed microfleece inner fabric feels soft against your skin. Additional features include the Ariat branding (which I’m partial to), two zippered hand pockets, a two way front zipper and a mock collar. This is an awesome sporting jacket to put on when riding and working in and around the stables. The windproof and water-proof shell will protect against the elements, while the microfleece lining will aid warmth. Handy zip pockets will keep all your valuables. You don’t need to worry about anything falling out while you’re riding! Wind-resistant and water-resistant outer blocks cold air and offers protection from light rain. Silky twill softshell with microfleece backing. Zip Napoleon and hand pockets. Let me know if you have any questions about the jacket at all down in the comments. If you get one, feel free to give your own review or thoughts and even send us over pics of you and your horse ! This is a great review of the Ariat Team riding jacket. My daughter has been riding since age 4 and she loves this particular jacket. It’s the perfect jacket for spring and fall when the air is crisp and cool. I will add that it launders beautifully, keeping it’s shape if hung up to dry. Thanks for adding from your experience 🙂 I totally agree. I find that Ariat products are always so durable – it’s one of my favourite things about them.